Modern building design is more advanced and cost-effective than ever. Structural steel fabrication has evolved to be more efficient and eco-friendly, allowing builders across the globe to create beautiful, structural sound buildings that serve to inspire. Many components go into steel construction, with each piece relying on precision and quality for the best outcome. It’s important to know that structural steel erection provides long-lasting strength, but the overall quality of your building will rely on its weakest components — the connections. Sanilac Steel is proud to be your trusted team of steel erectors in Michigan, delivering long-lasting results sin 1967. Our steel frame construction experts are dedicated to providing the best results that are as cost-effective as they are safe. For decades, we have set the standard for steel structure building across the state. Our high-quality training centers on improving the weakest components of any steel structure design. 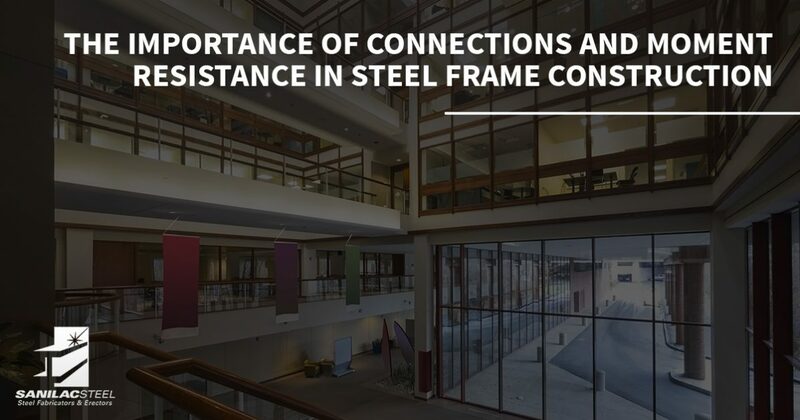 Today, we’ll highlight the true value of connections in structural steel erection. If you’re in need of a steel fabrication company that can provide all of your needs in a reliable manner, be sure to call us! To begin, it’s important to point out that a majority of structural failures today stem from faults within the connecting elements. In many cases, the steel structure designer will include suggestions and information for steel connections, but in many cases, it falls on the contractors. Our steel erection specialists understand the needs for varying building elements, providing quality outcomes across your entire structure. The type of connection used with your steel construction can provide a wide range of advantages when used properly. In general, there are two types of connections used, with a third strategy that is ideal for multi-story buildings. Pinned connections, as the name implies, relies on pins to provide support and transfer load stresses. These devices provide strength and stiffness for your building, but the simple design allows for considerable rotation, reducing frame strength. By transmitting only the end shear, your building is left vulnerable to other planes of problems. Fixed connections consist of rigid outcomes that are achieved with professional welding services. Unlike pinned connections, welds can resist rotations and other moments of stress. Steel erection often involves welding plates for added resistance and stability. Spliced connections are useful when stiffness and strength are needed for continuous spans. This process provides support to each axis, often consisting of large surfaces around the edge of your beam for optimal strength benefits. Simple connections rely on gravity and friction to resist load failures. Without any connection support, these elements are the least sound and never used in construction. As we mentioned earlier, fixed connections are advantageous for moment resistance. This phrase, which translates to the intense stress that can be placed on your building for a short lapse of time (earthquake, fire, wind, flood), helps designers and builders to create a uniform structure that can resist a wide range of potential problems. Moment resisting connections are used in many applications, especially for larger buildings and unbraced structures. This design benefits from a column that is attached to a beam with no release points. The rigidity and uniformity of these frames and connections allow for moments of flexure, giving builders more room when dealing with structure limitations. While moment resisting structures are much more able to handle intense design loads, the cost of this steel structure design method can become too much. In many cases, moment frames can cost twice as much as braced frame options. Sanilac Steel is here to offer knowledgeable steel frame construction solutions to get the most out of your investment. One cost-effective option includes increasing the column sizes. Double plating is required in some points, increasing material and labor costs. Bulk up your column size to reduce the demands on your beams! When it comes to structural steel erection, the strength of the building relies on welding services for the best outcomes. It will fall on you to invest in a team of steel erectors that have the tools, training, and experience to provide quality connections throughout the structure. Our experts work hard to deliver accuracy and speed throughout the entire project, resulting in more affordable outcomes. If you’re in need of steel erectors across Michigan, Sanilac Steel is here and ready to get to work. Our team relies on the safest practices, modern equipment, and a half-century of experience in the industry to deliver the best results for your project. Contact us today to learn more and to receive an estimate!